He said he voluntarily went to a police station to accept the caution as "it was better than the alternative of this hanging over all of us for months". Scotland Yard earlier confirmed that a 70-year-old man "accepted a caution for assault" on Monday afternoon. Celebrity chef Ms Lawson has not commented. 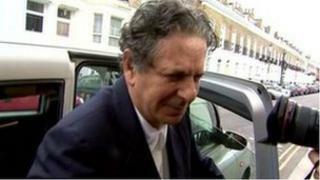 According to London's Evening Standard, Mr Saatchi said: "Although Nigella made no complaint, I volunteered to go to Charing Cross station and take a police caution after a discussion with my lawyer because I thought it was better than the alternative of this hanging over all of us for months." Mr Saatchi had reportedly said on Monday that the photos in the Sunday People showed "a playful tiff". Announcing the caution late on Monday night, Scotland Yard said "officers from the community safety unit at Westminster were aware of the Sunday People article which was published on Sunday 16 June and carried out an investigation". The photos were taken about a week ago in London, at Scott's restaurant in Mayfair. A simple caution is a formal warning given by a police officer and does count towards a criminal record. In order for a caution to be issued, someone has to admit an offence and agree to be cautioned. If they don't, they could be charged. A conditional caution requires the person cautioned to stick to certain rules and restrictions. If they don't, they could be charged with a crime. A caution is not a criminal conviction, but it could be used as evidence of bad character if the person goes to court for another crime. The restaurant issued a statement, saying: "The staff and management at Scott's are aware of the reports in the media and would like to make it clear that they did not see the alleged incident nor were they alerted to it at the time." Mr Saatchi, a former advertising executive, and Ms Lawson have been married since 2003. Ms Lawson's spokesman confirmed on Monday that she had left the family home on Sunday with her children, but did not say whether it was a permanent or temporary move. The daughter of former Conservative chancellor Nigel Lawson, Ms Lawson first began a restaurant column in The Spectator in 1985 and by the following year had become deputy literary editor of The Sunday Times.